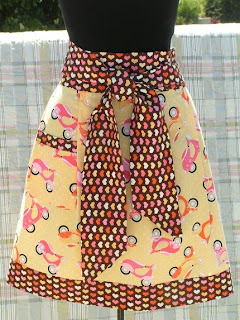 This apron, featuring yellow Vespas, has been our most popular apron to date. It was created using fabrics from the Bon Voyage collection by Moda. The fabric features a beautiful yellow color and is perfect to add a little sunshine, even on days when the sun doesn't shine. You can find it in our etsy shop by clicking here.